I am really excited today to share a post with you from one of my favourite bloggers. Jessica from Be Happy & Buy Polish agreed to do a guest post for me today and she has come up with some stunning nail art. If you don’t already know her blog, go check it out – she shares a range of gorgeous indie and mainstream polishes and does plenty of fun nail art. Hi all! I’m so happy to be here with you today sharing some funky nail art for Kerry. Painted Fingertips is one of my favorite blogs, Kerry creates such bea utiful manicures and always has something sweet to say. 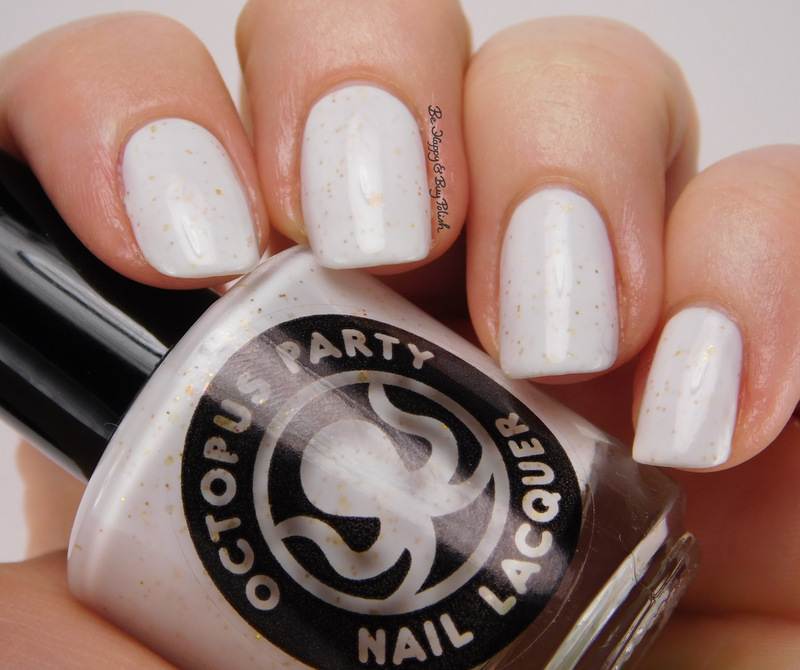 For my manicure that I’m showing you today, I started off with 3 thin coats of Octopus Party Nail Lacquer‘s Angel Dust. This is a white creamy base with gold and pink flakies. Formula was okay on this, if a little thin. But it makes my nails look so delicate and beautiful! I applied chevron nail vinyls of two different sizes on my nails and then painted over with Pretty Serious Cosmetics Khepri’s Amulet. Khepri’s Amulet is this glowy blue green nail polish with golden shimmer. The green (seen in the bottle) is more prominent in real life. I hope you enjoyed my manicure today, I’d love if you followed me at my blog, Be Happy And Buy Polish, on Facebook, twitter, and Instagram. Thank you so much for sharing this look with us Jessica! Isn’t it gorgeous? I just love Angel Dust and it’s even better paired with Khepri’s Amulet like this. Seriously – go take a look at Jessica’s other work at the links above. Very cool! I love these colors together. So this is a really stupid question and I haven’t had any luck with it…. when you put the chevrons on and paint over it – do you let the paint dry before taking the chevrons off? I’ve tried doing it when it’s wet and it ends up so gooey and smeary that I just can’t even. Any recommendations? Thanks! I usually paint over and let set for, oh I dunno, 5-10 seconds. Then I take off the vinyls. You do have to let it dry thoroughly before applying top coat. Ohh I so need Khepri’s Amulet, that glow is otherworldly! It is so pretty! You definitely need it. Thanks for having me Kerry! 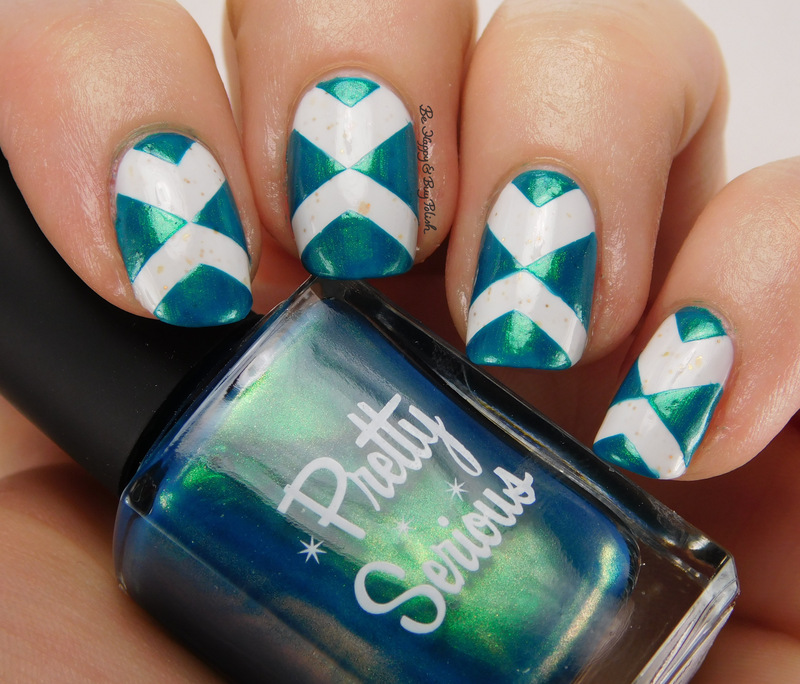 I really enjoyed creating this mani for this post. You’re going to make me blush now! Oh wow, this is lovely Jessica! Angel Dust is so pretty, a perfect base! Wonderful polish combination and the nail art came out perfect! I love the way you paired this Jessica, such a bold look! Khepri’s Amulet looks like such a mermaid dream in a bottle! Love the combination of the two, so beautiful. Angel Dust is such a pretty color! It is so lovely and delicate. Oh my, I really love this look! Both polishes are just stunning! That final look is LOVE! Beautiful! How is Angel Dust such a simple shade yet SO BEAUTIFUL? I’m in love.